As we posted recently, the Wilshire Bus Rapid Transit project recently released its draft environmental impact report/study (DEIR). That’s a key document that has to be completed before work on the peak-hour bus lanes on Wilshire can begin construction. Here’s a link to the presentation used at public meetings about the DEIR. The project proposes to add about 9.5 miles of bus lanes in the city and county of Los Angeles that Metro believes will cut bus travel times on Wilshire by about 25% and also provide a smoother ride after the lanes are reconstructed and repaved. The bus lanes will be the curb lanes and will only be used during rush hours. Metro officials are targeting a 2012 completion date. Public comments are being accepted on the DEIR until July 26. The easiest way to submit a comment is to email wilshirebrt@metro.net; put “DEIR” in the subject line of your email. We anticipate going to the Board to consider the Wilshire BRT in October 2010, followed by the Los Angeles City Council and County Board of Supervisors in November 2010. If approved, work could begin as early as December 2010. The project is funded largely through the Federal Transit Administration’s Very Small Starts Program and also includes matching funds from the City of Los Angeles and our Agency. 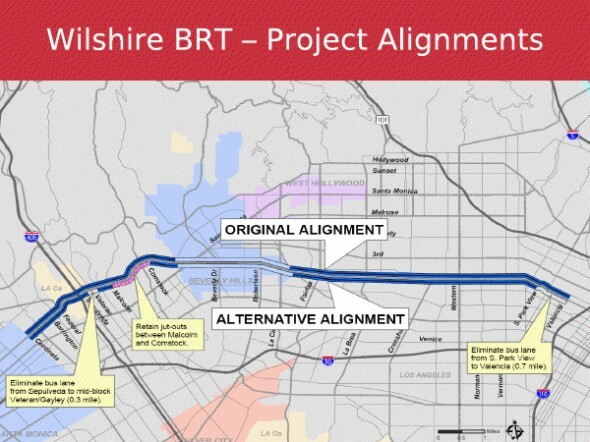 If implemented, the Wilshire BRT Project would create curbside peak hour bus lanes along Wilshire Boulevard from just west of downtown to the Santa Monica City line at Centinela Avenue. The segment of Wilshire Boulevard within the City of Beverly Hills is not included in this project but could be added in the future. The project also includes some curb lane improvements along significant portions of Wilshire Boulevard. The Wilshire corridor is the heaviest used transit corridor in the Metro system with over 80,000 bus boardings per day. 1. The ability of buses to share the curb lane with right-turning traffic and cyclists. 2. The impact on traffic of moving buses mostly to the right lane. Finally, I am pleased to see this project finally moving along — it took quite some time to get the DEIR out to the public, as this is a project being done by Metro, the city of Los Angeles and the county of Los Angeles. Until the Westside Subway Extension is completed, the bus lanes seem to offer the best hope of improving transit along the Wilshire corridor. And once the subway is built, the bus lanes should help people quickly travel to and from the train stations.